FILE - People walk past a police truck in DRC's capital Kinshasa, Dec. 19, 2016. Military and police units were deployed across the city amid fears of unrest on the last official day of President Joseph Kabila's second term. In the Democratic Republic of Congo, the United Nations says it recorded a significant increase in the number of human rights violations committed over the past year, and that state security forces were the main perpetrators. The spike in violations has been recorded by the U.N. Joint Human Rights Office in its newly-released report for the Congo for 2016. The director of the human rights office, Jose Maria Aranaz, says there was marked deterioration. “We are particularly worried about the dramatic increase in human rights violations documented in the territory of the Democratic Republic of Congo. Our office has documented 5,190 human rights violations, which represents a 30 percent increase compared to 2015, which was already a year of increase compared to 2014,” Aranaz said. DRC government spokesman Lambert Mende told VOA the figures sound “exaggerated” but declined further comment as he said he has not seen the report. The U.N. says Congolese security forces committed most of the documented violations, while the rest were attributed to armed groups active in the east of the country. 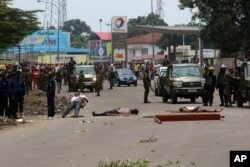 FILE - The bodies of people killed during anti-Kabila protests lie in the street as Congolese troops stand by, in Kinshasa, DRC, Sept. 19, 2016. The report draws special attention to the restriction of political rights which Aranaz said quadrupled in the past year amid opposition to delayed elections. On New Year's eve, President Joseph Kabila’s ruling alliance and most of the opposition signed an agreement. If implemented, this deal paves the way both for delayed elections to take place in late 2017 as well as a delayed departure for Kabila, whose second and final term expired last month. Aranaz says it is crucial to ensure political freedoms during this precarious transition. “There is also a specific part in the political agreement signed on 31 December which refers to confidence-building measures. This refers basically to the opening of democratic space, the release of political prisoners or prisoners of opinion," Aranaz said. Aranaz added that his office has also been pushing for other rights. "We have been advocating that these confidence-building measures go beyond the political prisoners’ element and include lifting the ban on demonstrations for the opposition, stopping the instrumentalization of the judiciary, bringing the perpetrators of human rights abuses to justice, allowing media professionals to conduct their activities in a healthy environment and without threats, and for the police to refrain from using lethal weapons in crowd control,” Aranaz said. Earlier this week, Congolese authorities ejected a Human Rights Watch researcher from the country for the second time.